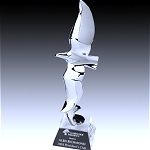 Our eagle awards and trophies represent freedom, courage, patriotism, leadership and strength. 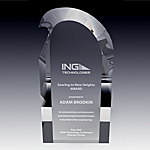 Flying high these awards feature a combination of exclusive materials: crystal , fine pewter, chrome and pâte de verre. 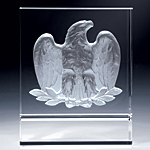 Our unique collection of crystal awards and trophies that feature eagle design is dedicated to strong spirited individuals who lead others by example and soar to new heights of success. 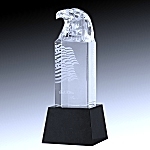 Eagle awards also represent patriotism, courage and freedom. 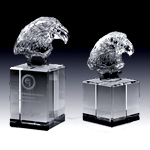 Present these crystal awards to visionaries who gaze far into new horizons and inspire others to follow the lead. 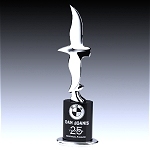 Our exclusive Soar High award has been on our best seller list since it was first introduced. 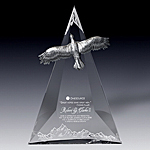 The design features a mountain range engraved on the crystal plaque and a fine pewter eagle flying free in to the distance. 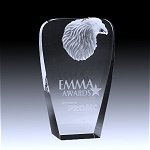 Many organizations choose this crystal award as the highest honor achievement token. 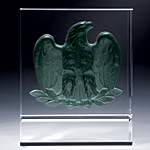 The Rushmore Eagle Award is available in three unique colors and is crafted by using an exclusive pâte de verre crystal technique. 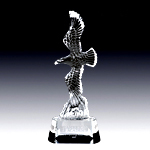 Chrome eagle award features a chrome plated eagle sculpture set a top of crystal base. This modern representation of eagle is very impressive in the boldness of the design. 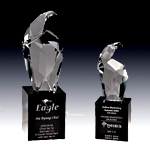 All of our crystal eagle awards can be personalized further with your choice of text and logo.